Ukraine, the second largest country in Europe after Russia, is characterized by broad, fertile agricultural plains with a concentration of heavy industry in the eastern region on the Russian border. Once part of the USSR, Ukraine gained its independence from the Soviet Union in 1991, though it remains locked in a tense relationship with its eastern neighbor, on which it depends for oil, but which has in recent years annexed part of its territory (the Crimea) and fomented an ongoing civil conflict. As a result, Ukraine, with a population of 46 million, is one of the few places in Europe that remains undeveloped and relatively unknown to tourists, despite its rich history and natural beauty. Among the undeveloped potentials in the country is golf; there are in fact but 3 real courses in the country, in addition to some nondescript resort layouts, though plans exist for new facilities in the future. 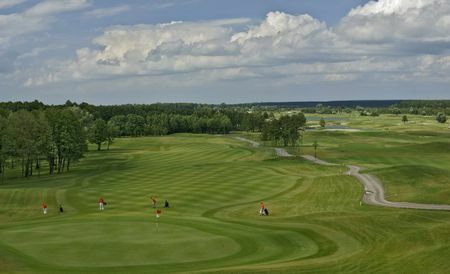 With an eye to that future, the Ukrainian Golf Federation staged the Kharkov Superior Cup, the country's first European Challenge Tour event, in 2013. The venue for the Cup was the 7000-yard links-type course at Superior Golf and Spa Resort, whose amenities include a five-star hotel and a golf museum. Sadly, the crisis with Russia has prevented this tournament from being played again. Among native Ukrainians, most golfers belong to the business elite, but there is also Andriy Shevchenko, who was a soccer star play for Milan, has gone on to become a keen golfer with a possibility of going pro in his second sport.